Chip Rice received his Bachelor of Science degree from the United States Military Academy in 1982 and was commissioned as an Armor officer in the United States Army. He served six years on active duty and resigned his commission as a Captain in 1988 to attend the University of Kentucky College of Law. While attending law school, Chip was selected as a Notes Editor of the University of Kentucky Law Review. He received his Juris Doctor degree in 1991. Upon graduation, he began his practice with a large law firm in Nashville, Tennessee and subsequently moved to Tampa in 1993. Chip joined Bush Graziano Rice & Platter in 2000. He is currently the Managing Shareholder. Chip is an experienced trial attorney whose practice is focused on the defense of products liability claims, with an emphasis on children's products, medical malpractice, long-term health care and general and premises liability claims. He has tried a number of cases to verdict in Florida in both state and federal court. 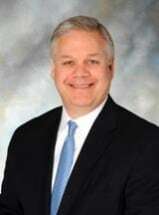 He is rated "AV" by the Martindale Hubbell Law Directory, was named to the Florida Super Lawyers lists from 2008-2018. Chip is admitted to practice in the States of Florida and Tennessee, the U.S. District Court for the Middle, Eastern and Western Districts of Tennessee and the U.S. District Court for the Middle, Northern and Southern Districts of Florida.